The ancient Vietnamese people were first known simply as the Lạc or Lạc Viet in recorded history. Archaeological evidence of the Bronze Age Dong Son Culture suggests the ancient Vietnamese people were among the first to practice agriculture. 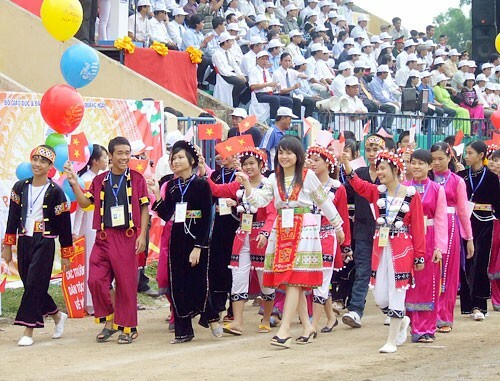 The country is home of 54 ethnic groups with the population of, according to the result of Census April 2009, around 86 million in which the largest group is Viet or Kinh occupies 86 percent who concentrated in the alluvial deltas and coastal plains of the country. The rest is shared among 53 other groups who live mainly on the mountainous areas and along the borders. Many Vietnamese people believe that they are descendants of Dragon and Fairy couple who had 100 sons. Because the dragon was a water creature and the fairy was a land creature, they decided they could no longer stay together. The fairy mother took 50 sons to the highlands, and the dragon father took 50 sons to the coast. The oldest son later became the founder of the Hung Dynasty which is thought to have existed from as early as 2769 BC until 100 AD. For centuries Vietnamese society was knit together by Confucian norms based on five relationships: King and subjects, father and son, husband and wife, brother and brother, friend and friend. These norms influenced the evolution of Vietnam as a hierarchic, authoritarian society in which Confucian scholarship, monarchical absolutism; filial piety, the subordinate role of women, and the family system were regarded as integral to the natural order of the universe. Kinship plays an important role in Vietnam. In the majority of rural Vietnam today one can still see three or four generations living under one roof. Vietnamese people practice different religion and belief but none of them are fanatical. With the majority come from the same origin, their nature, character and style are not much different though their accent diverse from place to place. Through the process of building and protecting the nation with many vicissitudes of thousands year Vietnamese people still keep their strong identity. The population of Vietnam now is around 87millions with 54 different ethnic groups, in which Kinh or Viet, the largest group, makes up around 86% of the whole population, and 53 other ethnic groups represent over 10%. – The Viet – Muong Group includes 4 ethnic groups: Chut, Kinh, Muong, Tho.